While on the run, Lars and Vampirella get a hand from Nosferatu. The ancient, and hungry, vampire explains how his people ended up on Mars and discoverved an older race. It's an extended detour that provides plenty of exposition to get out of the way heading into issue 6. We have a better understanding as to why the Nosferatu exist and their place on the red planet. Meanwhile, the team back at the base get a glimpse of the xenomorph lurking in the arbor and realize their gassing solution failed. A concerned Sarah back in orbit is determined to land and get her husband. Even telling Lars she's been cleared to approach the base. As any good sci-fi horror fans knows nothing good can come from that decision. I would have liked more development of the secondary characters on the base and in orbit but I understand this series is about the titular characters. Still, I would have liked to have some connection to the poor saps before they were brutally killed. Garcia-Miranda continues to create great layouts that can intensify scenes. Some of them can feel suffocating as necessary and equally treacherous. The scene with Lars, Vampirella, and Nosferatu in the ventilation tubes is a great example of this. Again here, Garcia-Miranda excels at delivering tense action with a terrifyingly rendered xenomorph. 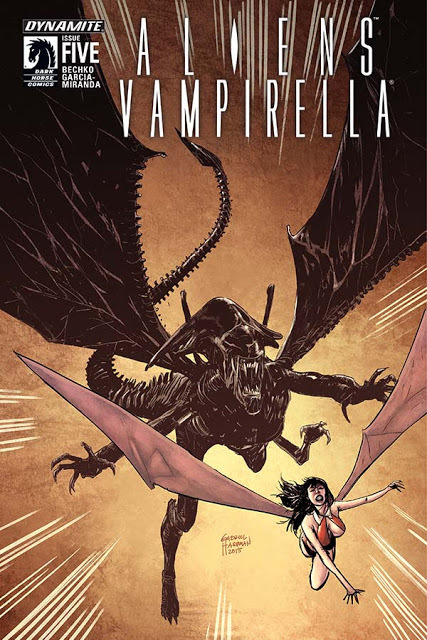 'Alien/Vampirella' #5 might be the table-setter for the grand finale but it's well constructed and excuted. Some of the details of the series are filled in clearing the way for what promises to be a potentially devasting ending.